The Genotype Diet is an expansion on the concept of the Blood Type Diet which was created by naturopathic physician Dr. Peter D’Adamo. Dr. D’Adamo classifies people into six distinct genetic body types based on how certain genes and physical characteristics are known to occur in combination. He claims that customizing the diet and lifestyle to suit each genotype is the key to achieving weight loss and optimal health. Although we can’t change our genes, we can influence the environmental aspects such as nutrition, exercise and how we respond to stress, which will in turn affect the way that the genes are expressed; either supporting health or contributing to illness. Tall and athletic, with a square jaw. Prone to inflammatory diseases such as allergies and rheumatoid arthritis. Blood type O. Emotional temperament and usually have a high BMI. Often have a history of crash dieting and have problems with appetite regulation. Blood type O or B. Naturally flexible and enthusiastic nature. Susceptible to bacterial infections. Blood type A and sometimes AB. Muscular, adventurous and intelligent. Sensitive to caffeine and medications. Any blood type but often Rh-negative. Charismatic and highly strung. Often age prematurely. Blood type A or AB. Very tall or short. Quiet, optimistic and rational nature. Often have sensitive digestive systems. Blood type B or AB. The specific foods recommended vary depending on which genotype you belong to. Each genotype has a list of foods that are beneficial for that specific type. General dietary structures and composition of protein, carbohydrates and fats will also vary for each type. For example a ‘hunter’ will thrive on a diet that contains generous servings of red meat whereas a ‘gatherer’ will do better on a predominantly vegetarian diet. The health benefits of specific foods for each genotype are highlighted and D’Adamo explains the reasoning behind the tailored approach to address particular aspects of health for each type. As with diet suggestions, exercise recommendations are specific to each type. ‘Nomads’ are advised to engage in gentle exercise such as yoga to help to reduce stress and balance their sensitive constitutions. The naturally athletic ‘explorer’ types should perform more strenuous activities that help them to break a sweat. 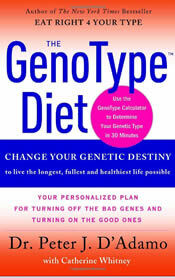 The Genotype Diet book is available for $24.95. Customized program to suit specific health issues and body tendencies. Supported by a large number of scientific studies. Provides exercise and lifestyle advice in additional to diet recommendations. Necessary to sign up for the online program to access recipes. The book provides food lists only. Meal preparation may be difficult when members of a family are different genotypes. The Genotype Diet is supported by scientific research though it appears that many of the changes that are observed in regard to health and weight regulation may be due to general diet and lifestyle improvements. Nonetheless if you like experimenting with different ideas and learning about the science of nutrition and health this program may provide you with new inspiration to make some beneficial adjustments to your current diet and lifestyle. He averiguado mi genotipo, y me ha dada cazador, pero no me coincide que no soy alta, solo mido, 1.55. Puedo ser de este genotipo? Huh? Where’s the scientific research…???? El libro esta muy interesante por que te explica practicamente 6 tipos de dieta. Todo ser humano es diferente pero se puede adaptar a una de las dietas que se explica en el libro. I tried figuring out my genotype but fit in 2 or 3 categories… how can you filter it or get it so you know exactly what you are? I just ordered the book.I have a serious condition,an auto-immune issue, which the book was spot-on about. I will check back after trying it out for a while. The blood type diet was good, but this is AMAZING!! Everyone who I have helped figure out their Genotype is thriving beyond hopes and expectations. I have tried every diet/ food lifestyle from blood type O diet, to being vegan for 12 years to raw foods, alkaline, food combining, and macrobiotic. Being on the Hunter diet has given me the energy, clarity, focus, strength, agility, flexibility, and endurance I have always known I should have. It is worth every minute of extra care, work it takes to do it. I almost died on this diet. It is complete brainwash. Stay away. For more information search blood type diet on wikipedia. They are all about deceit. Don’t do it! I found a lot of the information in the blood type diet to be useful, but limited–eating for my genotype, much less so. Yes it is more expensive to eat less common foods, and harder to find a lot of things–but it is possible to eat this way–even in Southern New Jersey! I have not had an antibiotic, or needed to see a doctor for I don’t know how long–since I used to eat out of a box. I have not been sick, except for mild symptoms that my body takes care of, for over 3 years. I think this diet is great for people that take full responsibility for their health. I think some of his information makes sense, especially after seeing some research online related to some of his discussions and other scientists input. However, the food lists are VERY restrictive, unless you have easy access to ostrich, kudzu, moose, purslane (what is that?). I don’t have the money or easy access to the “superfoods” listed. And easy access, affordable foods are on many of the “toxin” lists, such as bananas, tilapia, even wheat flour. Very unrealistic…. or if I had my personal meal planner and lots of money….I can dream, right? Absolute nonsense. How is there any link between enthusiasm and a sensitivity to bacterial infections? These groupings are completely arbitrary. How on eart could they deduce a whole diet plan based on this? Nobody on this planet at this stage knows enough about the human genome to make these inferences.